Disclaimer: Just Happiling did not receive any compensation by the company described in this blog post, and is only sharing this post for promotional purposes of the giveaway event, in exchange for online exposure as part of the campaign. Any opinions in the first paragraph are 100% our own. The rest is part of the event and information provided by Love, Mrs. Mommy blog. As you may know, in our blog we love to support any and all companies that promote healthy living, including those that offer organic alternatives to families. For us, it is important to spread the word on brands that offer organic choices, so that you can start your little one with the healthiest of diets as early in their lifetime as possible. This is why, we are very excited to bring the chance to win an introduction pack to our readers, by entering the giveaway in this post. 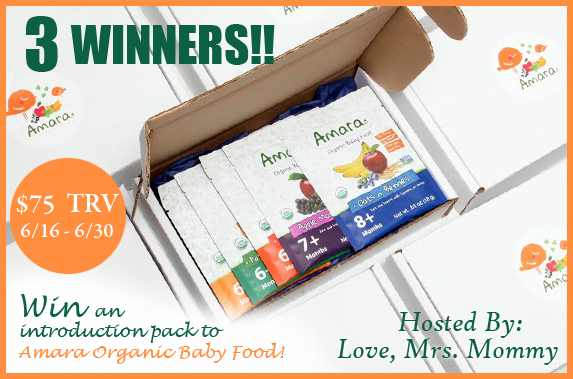 Three lucky participants, will receive $25 worth of Amara Organic Baby Food, from those entering via all promoting bloggers, including us. Good luck, and don't forget to share with your family and friends if you think they'll like to win too. If you like this content, remember to follow us through social media, or you can also subscribe via email on the blog's right sidebar. Disclosure: Love, Mrs. Mommy and all participating bloggers are not held responsible for sponsors who do not fulfill their prize obligations. This giveaway is in no way endorsed or sponsored by Facebook or any other social media site. The winners will be randomly drawn by Giveaway Tools and will be notified by email. The winners have 48 hours to reply before a replacement winner will be drawn. If you would like to participate in an event like this please contact LoveMrsMommy (at) gmail (dot) com. By entering, you acknowledge that you have read the terms and conditions of this giveaway event, and to release any and all social media venues and participating bloggers from any liability.